I chose Impression because it’s honest. It’s KASHO, refined to its essential form — and Impression doesn’t try to hide it. It’s this aesthetic, the graceful efficiency, that makes Impression so desirable. 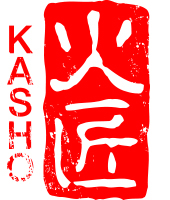 Designing the Impression Series, KASHO’s blade makers began their journey from the ideal starting point — an empty sheet of paper. They asked salon professionals a simple question — What do you really need? Uncluttered by convention, and free from preconception, Impression’s silhouette is clean, and its matt satin finishing graceful. 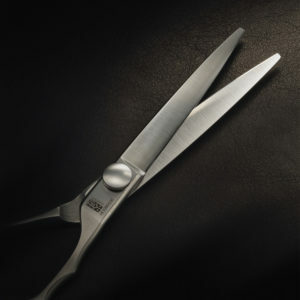 Even the ergonomic details, as the camel back, offset handle and finger rest, subtly enhance the scissors’ sense of poise. 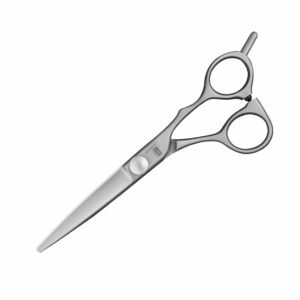 Impression’s semi convex blades are durable high-carbon steel, hollow-ground to give a better cut. Their cutting tension can be adjusted easily, thanks to KASHO’s ratchet screw system.